Real Salt Lake picked up its first win of the season Sunday afternoon, defeating Toronto FC at a sold-out Rio Tinto Stadium. Jordan Allen’s first career goal in MLS proved to be the winner at the death, although the result came with some refereeing controversy in the home side’s favor. Both squads were decimated by injuries, suspensions, and call-ups, but what the game lacked in star-power, it made up for in parity and late-game drama. RSL’s Luke Mulholland opened the scoring in the 38th minute, heading home Javier Morales’s cross at the back post. The goal was clean, and Morales picked out Mulholland’s unmarked run with ease. However, moments earlier, another Morales cross had nearly found the head of Devon Sandoval before being punched clear by TFC goalkeeper Joe Bendik. Replays showed that Sandoval was offside on that play. Had the call been made, the buildup to Mulholland’s goal would have been neutralized. Despite quality chances, Toronto found it difficult to break through, thanks in part to outstanding goalkeeping by RSL backup ‘keeper Jeff Attinella. Filling in for RSL with Nick Rimando away on international duty, Attinella denied Nick Hagglund from inside the six-yard box in the 71st minute, then followed up with a parry of a difficult Sebastian Giovinco free kick in the 78th minute. Hagglund appeared to have the equalizer in the 73rd minute with a header off a corner kick, but was adjudged to have held Chris Schuler while the ball was in the air. The replay showed that contact may have been slight. Real Salt Lake had a chance to salt the game away in the 87th minute, when a quality touch by Olmes Garcia found him and Devon Sandoval in a 2-on-1 situation. Garcia’s shot, however, failed to test Bendik and frustrated his teammates, as Sandoval appeared to have a much better angle on goal, although the pass would have been difficult. TFC promptly advanced the ball down the field, where a simple give-and-go between Jackson and Bright Dike resulted in a 1-v-1 against Attinella, and Jackson deftly tapped home the 88th minute equalizer. But RSL would not be denied. Only one minute later, after a quick kickoff and buildup down the right flank, Morales notched his second assist of the match with a pinpoint cross to Jordan Allen, who headed the dramatic game-winner past Bendik at the far post. The goal opened the eighteen year old’s MLS account in style and secured all three points for the home team. 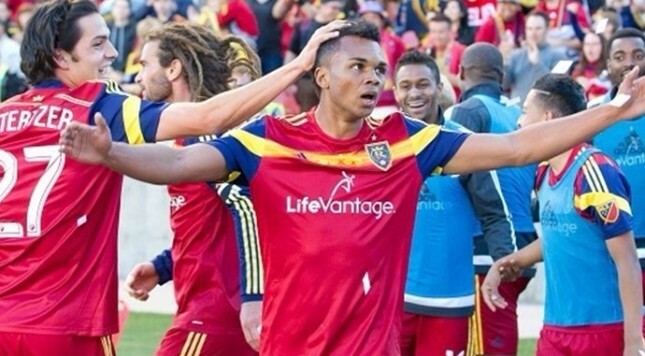 Unbeaten in three to start the season, Real Salt Lake are away at San Jose Earthquakes next Sunday. Toronto, losers of their last two, go to Chicago on Saturday in its fourth straight road game to start the season. Although “Beckerman vs. Giovinco” isn’t a bad headline at all, both sides were missing quite a few stars. RSL was without Alvaro Saborio (international duty), Nick Rimando (international duty), Luis Gil (international duty), Joao Plata (injury), Demar Phillips (injury), and Elias Vasquez (international duty), while Toronto were missing Jozy Altidore (international duty), Michael Bradley (international duty), Justin Morrow (red-card suspension), Steven Caldwell (injury), Eriq Zavaleta (injury), and Mark Bloom (injury). RSL may have been missing players all over the field, but TFC was without both of its first-choice center backs, a problem that proved critical on Jordan Allen’s free header in the center of the box to lock down the win for RSL. Toronto will feel particularly hard done by after this match. Referee Hilario Grajeda may have incorrectly disallowed Hagglund’s goal, while an offside call missed by an assistant referee allowed play to continue, ultimately resulting in Mulholland’s lid-lifter. Had the calls gone the other way, TFC may have stolen points on the road. RSL’s Argentine designated player Sebastian Jaime almost scored his first MLS goal for what seems like the umpteenth time, but, again, the goal was disallowed. THe assistant referee correctly ruled Jaime offside. Devon Sandoval deserves to be singled out for praise for his play leading up to the game-winning goal. Sandoval received a pass at the top of the box and held possession against four TFC defenders just long enough to lay the ball off to Morales for the decisive assist. Sandoval also deserves to be singled out for proposing to his girlfriend two hours before game time. Explaining his decision to get married, Sandoval said that he was listening to Bob Marley, and he just felt that it was what he had to do.